Building a house is a daunting task; however, our experienced loan officers will provide assistance to individuals in securing the necessary funds to make dreams come true. 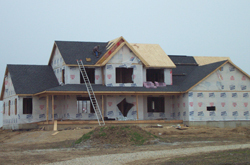 A construction loan is a mortgage that funds the construction of a new home. Once the loan is set, the borrower has unlimited number of draws. Our construction loan program is hassle-free. In addition, Bath State Bank has an in-house person who can complete the inspection. More details will be provided upon an appointment with a Bath State Bank loan officer. For more information, please call West College Corner at 765-732-3147 or Bath at 765-732-3022. Toll free at 800-463-7464.